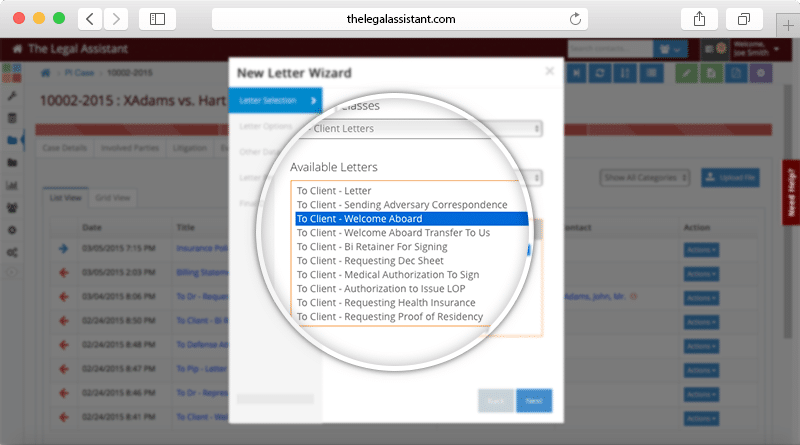 Regardless of which modules you use, whether Personal Injury or Real Estate, the following are just some of the features provided by The Legal Assistant. 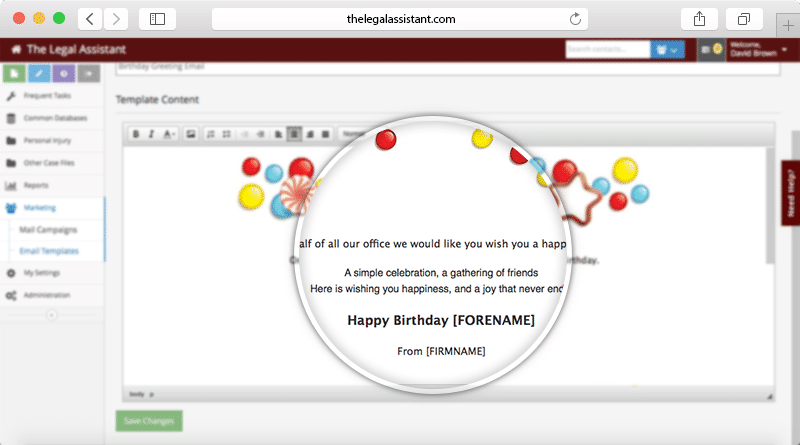 Your letters can be generated, and distributed via Email, Fax or hardcopy to appropriate parties at the click of a mouse. With hundreds of prewritten forms and templates you can run your practice immediately. But of course, you can add your own letters. Transparent integration with Microsoft Word allows your staff to edit letters without learning any new word processor. With digital signature support and letterhead management all letters are easily customized to your firms needs. With comprehensive support for both incoming and outgoing mail, your mail will never be more than a click away. Incoming mail can be scanned and quickly assigned to the right case files, whilst Email Monitoring will automatically look for new emails and attach them to the right case files for you, notifying relevant staff so even when you’re not working, The Legal Assistant is. 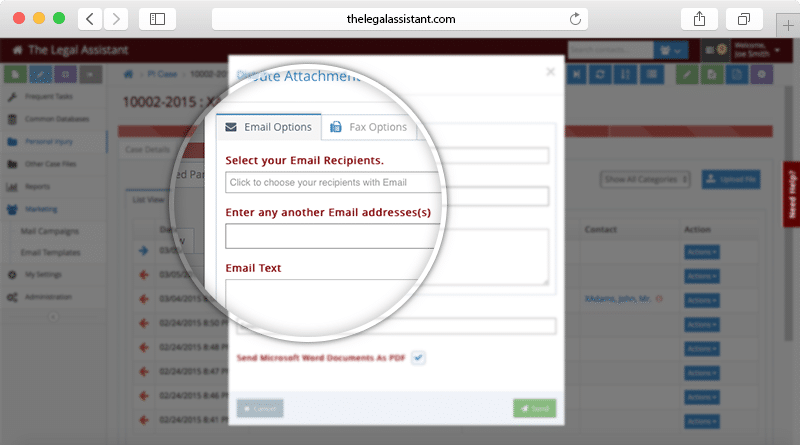 Letters and documents attached to case files can be emailed or faxed to selected parties with just a click. The internal communication between your staff is just as important as the letters you send out from your firm. 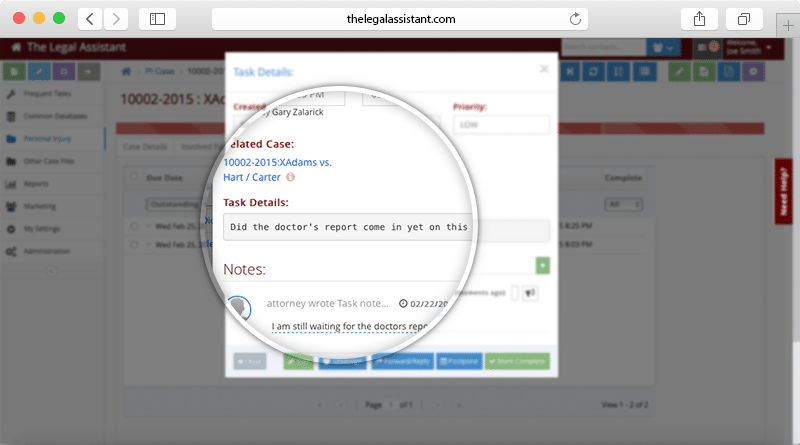 The Legal Assistant features comprehensive Task Management features providing users with full inter-office messaging capabilities, audio dictation, and To-Do facilities. Be automatically notified via Email of your to-do list agenda and calendar with nightly notifications so you are prepared for the upcoming day ahead. 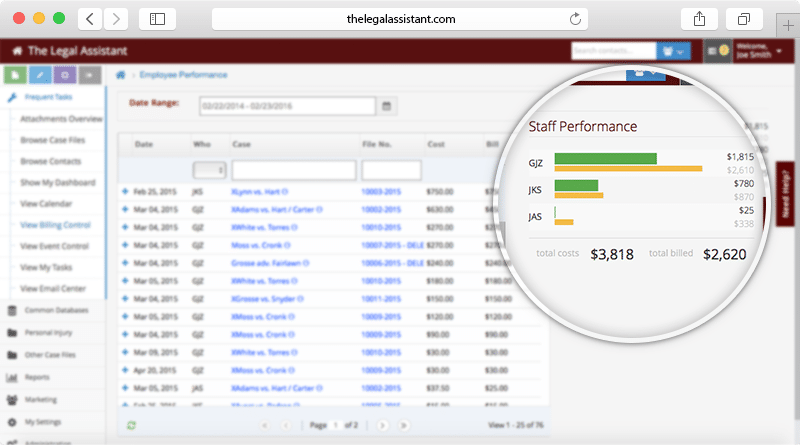 The Legal Assistant makes client billing a breeze accumulating charges and costs automatically to a file as your staff do their work. Statements and Invoices are produced with a click when required, or you can manage billing for all your cases through billing control which saves hours of time generating statements and invoices for those cases that meet the relevant criteria. Be kept in the know when you need to, watch cases for changes and be notified when someone makes a change. TLA’s event management even assembles documents automatically. For example; 30 days before trial, you need to warn your client of the upcoming event. 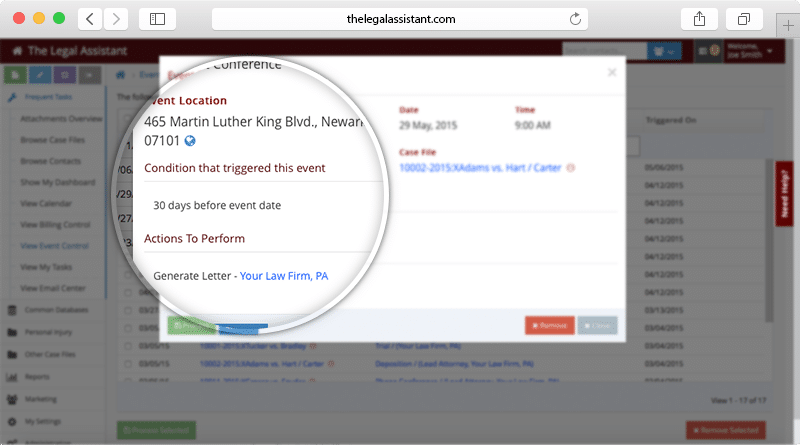 Event management will generate and sign the letter, attach it to the case file and notify you so you can quickly review the letter and any others event management has generated for you before you click again and have TLA email or fax the letter on to your client and any other interested parties. All of which is configurable for your firm’s specific needs, moreover TLA comes loaded with predefined events for each module. 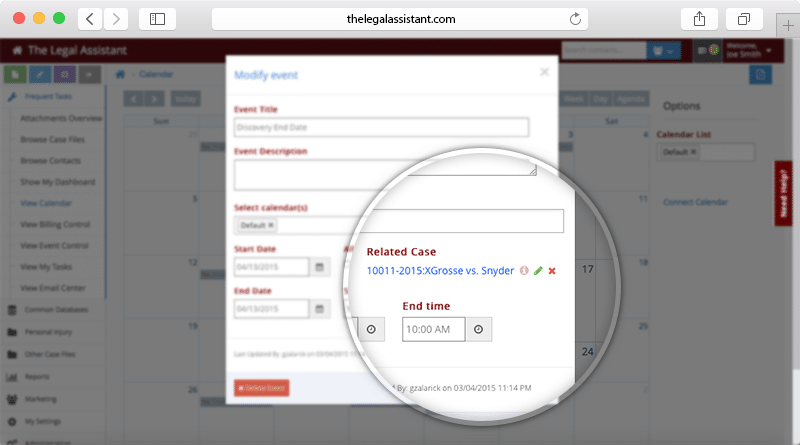 The Legal Assistant calendar gives you rapid access to calendar entries for both the firm and individuals. Any case related entries are immediately visible and give you one-click access to all the details of the case. Case ‘Events’, trial dates, for example, are entered automatically in the calendar saving hours of manual calendar/schedule management. Keeping in touch with your clients has never been easier. Want to wish them happy birthday, automatically? No Problem. Planning an open day? No problem, email everyone within a city or zip area and let them know by email or printed letter. Do you currently use another legal software system and are looking to change but are afraid you would lose your data? Relax, we would be happy to discuss your requirements further in more detail, the chances are we already have a converter for your existing data.